This past week a big announcement came from the National Institutes of Health. Dr. Steven Rosenberg, the leading authority on immunotherapy, a treatment he pioneered that uses a person’s own immune cells to fight cancer, told the world about Judy Perkins. In 2003 at age 38, Judy was diagnosed with stage 0 breast cancer. “At the time I was completely ignorant and believed that more is better, and apparently so did my surgeons,” she said at an National Breast Cancer Coalition (NBCC) Advocate Leadership Summit in 2017. So she had a mastectomy and a complete axillary dissection as her treatment. Two weeks later she was back at work as an engineer believing her journey with breast cancer was over. But she had a recurrence. Ten years later, she felt a lump and was diagnosed with Stage 4 breast cancer. Her doctor told her that she probably had three years to live. Reaching out to her cousin, Carol Bass, a long time advocate with NBCC, she learned that research has progressed and that she needed to get involved and do her own research. Going first to a Metastatic Breast Cancer Network conference, Judy learned that she needed to be treated at a comprehensive cancer center at the University of Miami where she would have access to clinical trials. Her new oncologist told her that most drugs work for about seven months and that she might go into remission. Unfortunately her first medication, abraxane, only worked for four months. None of the drugs he prescribed worked for her for very long.”I quickly realized I was not going to be on the right hand side of that median curve,” she told the summit members. 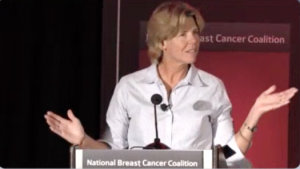 So she became more involved in breast cancer advocacy, attending her first NBCC summit in 2014. She got through 2014 having exhausted all of the standard treatments (about a dozen treatments, half of them were chemotherapies) but finally qualified for a clinical trial. This clinical trial treatment worked for six months, melting away her cancer, but she suffered from severe side effects so was forced to stop treatment. Feeling down after stopping the one treatment that worked, she almost didn’t go to a conference called Project Lead, NBCC’s science training program for activists. Fortunately, she did attend. At the immunotherapy session, the instructor, Dr. Stephanie Goff, told the group that she had a clinical trial she was running. “Of course, I immediately cornered her after class over a beer and forced her to tell me more about this trial,” Judy told the group. Within a few weeks, she had enrolled and became the first breast cancer patient in the country enrolled in this trial. 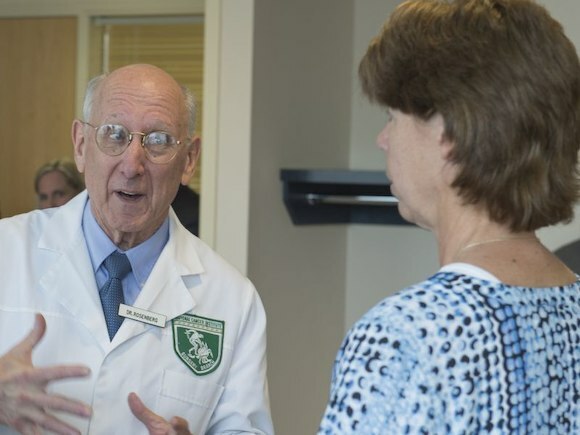 The trial was part of the larger NIH tumor infiltrating lymphocyte cancer trial run by Dr. Rosenberg. The trial that Judy was involved with is a little different from the ones that have been run on patients with melanoma. 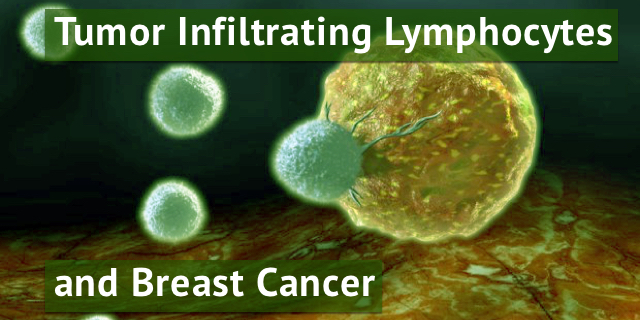 For melanoma patients, researchers collect tumor infiltrating lymphocytes (TILs) from patients and grow them. Then the patient receives a large infusion of these lymphocytes. Their treatment is called “bulk” because the researchers don’t select the lymphocytes for activity. They have about a 50 percent response rate, according to Judy. But in Judy’s trial, the goal is to use TILs for all solid metastatic cancers. In her trial, researchers did some genetic testing on the tumor, compared it to her normal DNA and found about 300 mutations. Then they selected the TILs that were “interested in those mutations.” They grew 81 billion T-cells which were then infused back into Judy (along with some interleukin 2). Seven to ten days later, Judy could feel that her tumors were dissolving and since May of 2106, the tumors have been gone. Judy has been NED for two years. ** To see Judy’s presentation at the NBCC Leadership Summit click the link https://nsp.performedia.com/node/16793 and watch for first 12 minutes. **Sadly, two other breast cancer patients who were also involved in the trial did not survive.